Hart's-tongue is not easily confused with other wild plants on this web site. 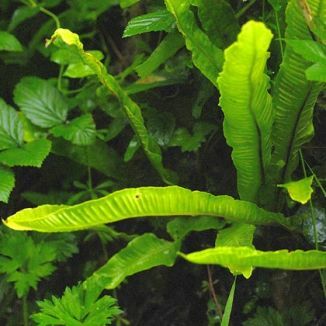 Also known as Asplenium scolopendrium, this is a widespread and familiar fern usually found by damp ditches, on limestone walls and in hedgerows. 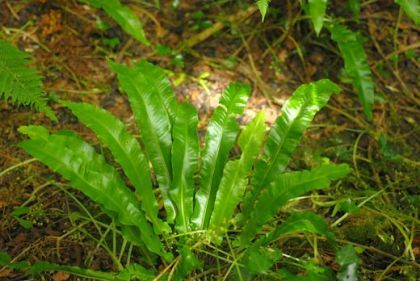 It produces long (60cm) untoothed leaves with slightly wavy edges, heart-shaped at the base but tapering towards the apex. The spores are arranged in lines along the reverse of the leaves. This perennial plant is an evergreen, the leaves remaining on in a somewhat battered state and being replaced by fresh leaves in June. It is a native plant which belongs to the family Thelypteridaceae. I first recorded this plant growing on the wall of our home in Co Dublin in 1965 and photographed it in Co Wicklow in 2005.